22 Small Things You Can Do Every Day to Feel Happy! - Something New Everyday! Home happiness 22 Small Things You Can Do Every Day to Feel Happy! 22 Small Things You Can Do Every Day to Feel Happy! There are certain moments in our lives where we may feel prone to feeling depressed. So, without breaking the bank, happiness expert Andy Cope, and co-author of The Little Book of Emotional Intelligence: How to Flourish in a Crazy World, will help bring some positivity into your life with these simple, yet highly effective tips. 1. Mondays do not need to be bad: Many of us hold the notion that Mondays are bad and Fridays are good. But, with the average life-span being 4000 weeks, a seventh of your life is lived on a Monday. So try to flip your thinking - Friday is another week closer to death, while Monday is an opportunity to make a dent in the universe. 2. Upgrade your underwear drawer: This may sound a little silly, but aim to upgrade your underwear drawer so that every item is worth wearing on a 'special occasion'. In doing so, every day will feel like one. 4. Practice the 10/5 principle: Smile at everyone who comes within 10 feet of you, make eye contact and say hello to everyone within 5 feet. 5. Say nice things about people behind their back: Think about it, when it gets back to them, people think you're a lovely person. 6. Make a list: Write a list of 10 things you really appreciate but take for granted - things like your health and certain relationships will surely be there. 7. Appreciate the little things: Being able to get out of bed is the best thing ever. Each morning, appreciate that you don't wake up with a toothache and that your kidneys are working. 8. List your 10 happiest moments: When you actually stop to write your list, you will realize that most of your happiest moments are experiences as opposed to products. With this in mind, make it a point to have more experiences. 9. Stop asking the question: How was your day? Instead, ask your partner or children, 'what was the highlight of your day?' and be sure to listen with genuine enthusiasm. 10. Walk tall and smile: Your brain will immediately think that you are happy, and you'll feel a whole lot better. 11. Change your aim: Change your state of mind, it's not about 'getting through the week' or 'surviving until my next holiday'. Instead, set your aim to 'enjoy the week' or 'to inspire people'. 12. List your 5 personal strengths: Be aware of what your strengths are and see them as opportunities to play to them more often. 13. Watch out for the 90/10 principle: This means that 10% of your happiness depends on things that happen to you, while 90% depends on how you react to these events. Always make a conscious choice to be positive. 14. When setbacks occur, ask yourself this: On a scale of 1 to 10 - 10 being death, where is the issue. If it is death, you are allowed to feel down, but anything else, get over it. 15. Challenge your critical voice: Most people have an internal voice that is very critical. When your inner voice is telling you that you are an idiot, disagree firmly and find a positive inner voice. 16. Spend time with friends: But when you do, be sure to spend less time on electronic friends and more time on real ones. 17. Practice the 4-minute rule: Be your best self for the first 4 minutes of arriving at work, being in a meeting, getting home. Feeling brilliant is infectious. 18. Lose the word 'try': Instead of setting a resolution of 'I'm going to try and lose some weight', or 'I'm going to try and get a bit fitter', opt for 'I'm going to lose some weight', or 'I'm going to get fitter. In the words of Yoda, 'Do or do not, there is no try'. 19. 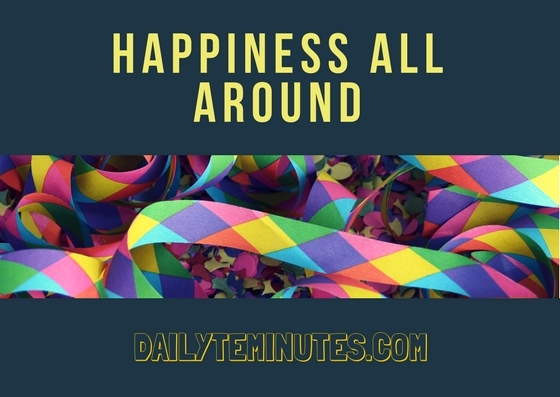 Happiness is bigger than you: Remember that happiness has a ripple effect and infects people three degrees removed from you. 20. Reframe situations: Consider things from a different perspective, a leaking gutter means that you have a house, paying tax signifies that you have an income, a teenager is spending hours playing on his x-box and not wandering the streets. 21. Be genuinely interested in others: Ask a lot of questions about them. People will find you incredibly interesting. 22. Use more positive than negative language: The ratio needs to be about 5 positives for every negative - if you catch people doing things well, tell them.